The image of Prince Shôtoku as a Confucian statesman is seen best in this portrait, the model for the ten thousand yen note. He is accompanied by his younger brother on the left and his eldest son on the right. He is in Chinese-style court dress, from the official hat down to the curly-toed aristocratic shoes. The wooden paddle in his hands was originally a kind of crib sheet for following complex court rituals, but in this highly idealized portrait it is simply a symbol of bureaucratic status. The Prince’s long and ornately jeweled sword also suggests political power. 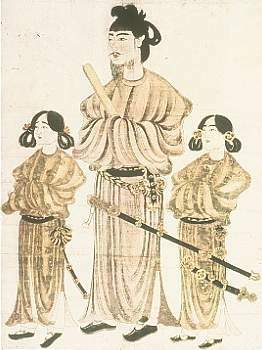 Although he was renowned as a man of peace, in other words, Prince Shôtoku could not be disassociated from the aura of the militaristic society into which he was born.